The question refers to the cost of higher education, and also its long-term benefit. To some extent, this is a bottom-line question, so let me begin with a bottom-line answer: In these challenging times, the long-term economic benefit of higher education is especially clear and compelling. Myriad studies show that U.S. college graduates have lifetime incomes some 70-80 percent higher than non-college graduates. In a surging global knowledge economy, the employment divide between those who have a college education and those who do not is growing. But this hardly settles the matter for us. Even if the economic value of a B.A. is clear, what about the merit of a liberal arts degree? What about a Brandeis education? At our spectacular commencement in May, blessed with the energy of our remarkable graduates and the good fortune of a perfect New England spring day, I told the members of the Class of 2012 that their time at Brandeis prepared them for the complexities of a world we literally cannot imagine today. They were educated to analyze carefully, to solve problems creatively, to communicate effectively and — perhaps most important of all — to transform information into knowledge. 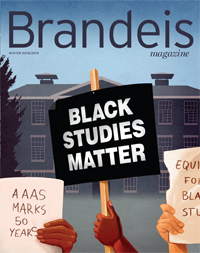 It is precisely the broad preparation that flows from a liberal arts education that enables Brandeis graduates to adapt with agility, honing their skills in pursuits as diverse as the challenges they face. At the end of the day, in the global economy, in a world of growing uncertainty, one thing remains certain: Critical thinking and creativity will be in high demand. To help leverage our graduates’ skills and opportunities, we have dramatically expanded the real-world experience of our students to augment their liberal arts education. Today, Brandeis students complete an average of three internships before graduating, up from an average of two five years ago. At that time, there were 3,000 internships listed through the Hiatt Career Center or the university. Today, there are 12,000. Employers increasingly recognize the value of Brandeis students and the contributions they can make in the workplace. Still, the bottom-line considerations only begin to answer the value question. A liberal arts education encompasses far more than job opportunities and is far greater than the sum of its parts — the classrooms, the dining halls and dorm rooms, the playing fields and theater stages, the labs and libraries. Citizenship in a technologically driven democracy is demanding and highly complex. Who will frame the tough questions that confront our families, communities and nation? Who will answer them? A liberal arts education makes it possible to do both. Our graduates’ willingness to engage in real relationships, build real communities, address and solve real problems and create pioneering knowledge is, in many ways, the hallmark of a Brandeis education. That is why I am confident that it is more than worth it; indeed, it is worth it now more than ever.